The 2007 Zodiac Pig is made from a pale pink material and is a slightly darker pink on the snout and on the inside of it’s ears. It has black button eyes and black thread stitching on it’s nostrils. It wears a red collar around it’s neck and attached to it is a gold tag with red Chinese writing on it. With friends like this, you’ll always belong! The 2007 Zodiac Pig was introduced on 30th November 2006. 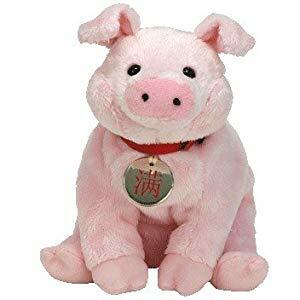 The 2007 Zodiac Pig is an Asia-Pacific exclusive Beanie Baby and is not to be confused with the more common Zodiac Pig. The pig was retired on 31st December 2007.